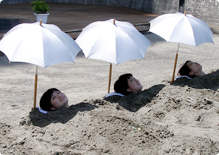 Ibusuki is the only place where you can experience Hot Sand Bath! Hot Sand Bath is the Japanese sauna which uses hotspring sprung out from beach. For our precious guests, we prepare a private space in front of our hotel, open-air clean hot spring to wash sand away and sky bath which has a great view. Please change to a dedicated Yukata for Sand Bath. Our staffs will wait you at the beach and please lie on the beach. The staff will cover your body with the sand which is warmed by the natural hot springs. Lie on the beach and relax for about 10 to 15 minutes while listening to the sound of waves, you will gradually sweat and it feels like all the waste in your body will be removed with the sweat. After getting out from the sand bath, please take a open-air hotspring next to the beach without taking off your Yukata to remove the sand on your body. After taking the hot spring, please take shower and get change to new Yukata. 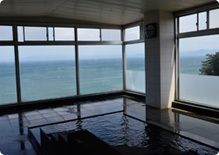 Then please go to the Sky Bath which is a glass-sided hot spring located at the top of the building. While taking the Sand Bath, the smoothness of the circulation of blood increases as you lying face upward. Also, the pressure of the sand helps to run blood throughout your body and the 50 degrees warm sand enhance the functions of the heart and the lung. This encourages an improvement of hemoperfusion. Other nodl positive effects of taking sand bath are an increase of the amount of cardiac output, elimination of the waste and inflammatory algesic substances. These effects lead to an enhancement of supply of oxygen and nutrition in your body. It is said that those positive effects by taking Sand Bath is three to four times higher than normal hotsprings. Our public hotspring is a bountiful hotspring which offer our guests a spacious bath, an ample supply of water and the beautiful prospect of the Kinko Bay under your eyes. 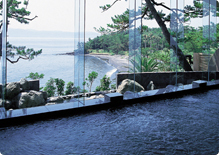 Our spacious glass-in hotspring has also open-air bath. Of course the institution of Ibusuki is the Sand Bath, however, experiencing our public hotspring would be as unforgetdl as Sand Bath experience. 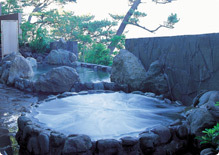 Bath, Open-Air Bath, Jacuzzi, Sauna and Cold-Water Bath. Hot spring in the mountains of Ibusuki naturally flow to the beach and it is gushed out from the beach of Ibusuki area and it is utilized for the Sand Bath. The nature of the spring is sodium salt spring and people often misunderstand that the hotspring is just warmed seawater. However, the components of the hotspring and the seawater are different. The spring contains numerous sodium ion and it is effective for neuralgia, cut, burn and chronic skin disease. It is also known that a chill after Sand Bath does not occur and many tourists have been enjoyed for long time. It is significant to enjoy taking bath by looking down the Kinko Bay at our Sky Bath which located in the top floor of Japanese Building. It can be also used for rinsing your body after taking the Sand Bath.